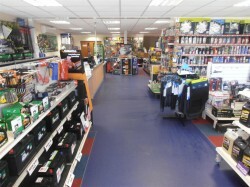 Guernsey Automotive & Electrical Supply Ltd, based in the Channel Islands needed to upgrade and extend their trade counter area to enable additional products to be displayed and generally upgrade their current facilities. 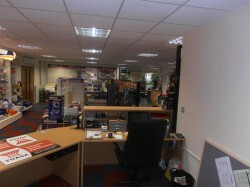 They also required a heavy duty mezzanine floor to enable storage of additional stock and operational working area. Hampshire Mezzanine Floors designed a free standing mezzanine floor not fixed to the fabric of the building that was pre-fabricated to minimise installation time on site. HMF then fitted the mezzanine floor with special combined handrail and steel mesh partitioning to the perimeter of the mezzanine to ensure the area was fully captive from a storage design. Access for pallets was designed using two up and over safety gates which ensured that at all times personnel had hand and knee rails in position when working on the mezzanine floor. A new opening was prepared from the mezzanine level into the existing first floor offices to allow ease of access to the existing office facilities and also for enhanced secondary means of fire escape. The mezzanine floor was made one hour fire resisting using a one hour suspended ceiling underneath, one hour facia and one hour column casings. The area was compartmented from the workshop using fire resisting insulated partitioning with pre-manufactured door and window frames. The area was ventilated by HMF using a highly energy efficient system which recycled the return air supply to heat the incoming fresh air into the area, thereby saving Guernsey Automotive & Electrical Supply Ltd in running costs. Further low pressure hot water heaters were utilised throughout the area. Modular lighting was provided throughout with integral emergency lighting and new LED spotlights were fitted to the window display areas. The project, which was completed on programme, resulted in a functional and pleasant environment for both customers and staff working within the area.